Another day, another round of golf. 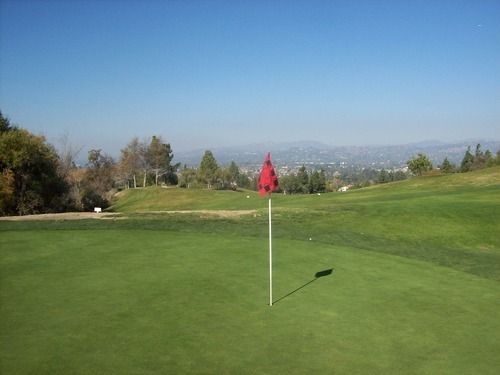 For me, this was a nice relaxing weekend with just two rounds of golf (one a day), but both were slow, so it still seemed to burn a lot of time on each day. 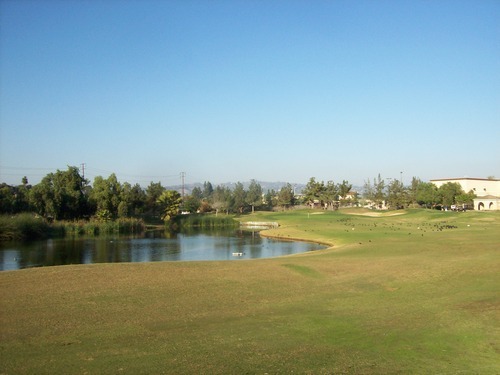 Sunday kept me a little closer to home with a visit to Westridge Golf Club in La Habra, which is basically right at the border between LA and Orange Counties. 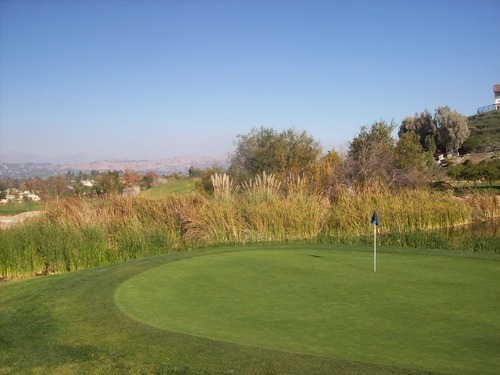 It’s a course I haven’t played in years, but one I’ve always liked. However, pace of play has always been an issue here and conditions in recent years haven’t been great from what I’ve seen on Greenskeeper.org, so I’ve stayed away until now. The condition issues seem to have improved greatly under the current management based on recent reviews, so that was encouraging. 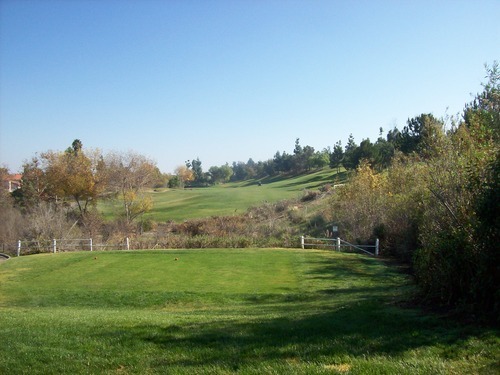 A couple of GK’ers reached out to me recently to meet up for a round, so Westridge was a good central location for all of us and the price was reasonable at $49 for an 11:10 tee time on Sunday. We actually teed off a few minutes early, which was a pleasant surprise. Things moved along pretty well on the first few holes, but then we hit the “wall” on the par-5 5th hole. Why it was so backed up, I’m still not sure, but there were two groups waiting on the tee when we pulled up. After that, it was slow going the rest of the day and the overall pace was a brutal 5.5 hours. 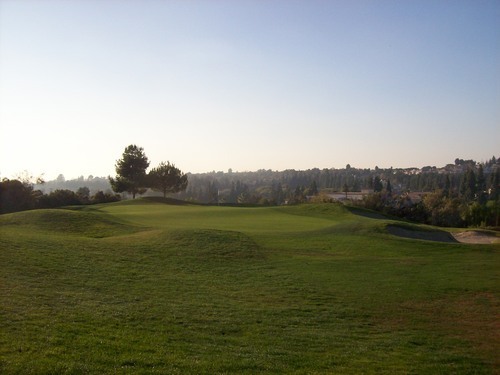 On the positive side, the course was in pretty nice winter condition. It was definitely a step up from some of the more “dormant” courses I’ve played recently. 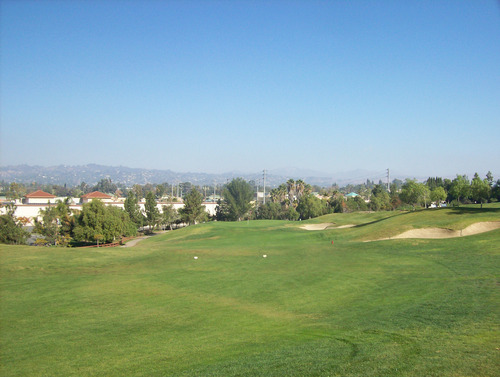 It seems they were doing what they can to retain a fairly lush, green look at Westridge during this part of the season. That said, everything was a bit too shaggy and slow. Some of the tee boxes were equivalent to rough on some courses. The fairways were left a little long, so there wasn’t much roll-out on drives, but the lies were decent most of the time. The rough was thick and really snagged the ball. With so many side-hill lies here, it really added an element of challenge. Everything was pretty soft and slow, with some wet/muddy areas throughout. The greens looked fantastic and rolled pretty well. Unfortunately, they were just a bit too slow. It was really difficult to judge speeds on these undulating greens with a lot of grain. 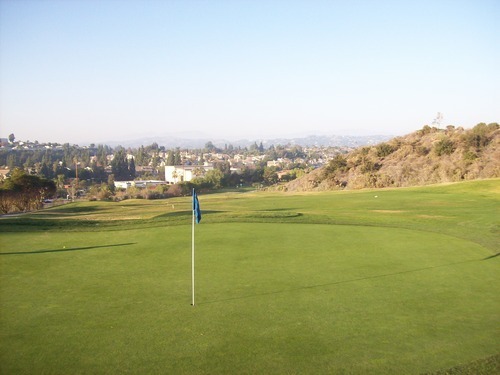 Downhill and side-hill putts could still be pretty slippery once you got past the hole. Uphill putts were generally very slow unless you were going with the grain, in which case you really had to be careful. 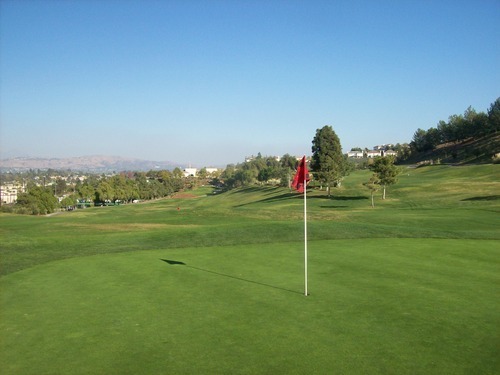 The greens themselves are kind of a microcosm of the whole Westridge design. It’s a very tricky layout. This is not a very long course, topping out at just over 6,500 yards from the black tees. It’s a target design with very few flat lies on the entire course. 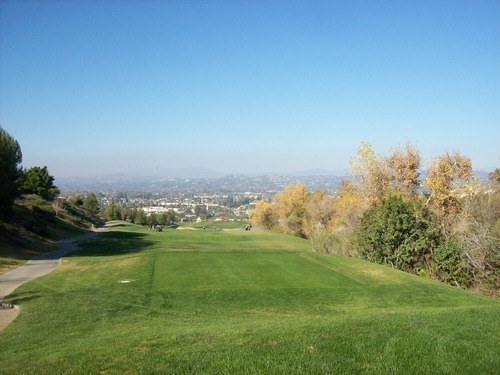 Most fairways slope severely from one side to the other, so it pays to aim toward the top side. 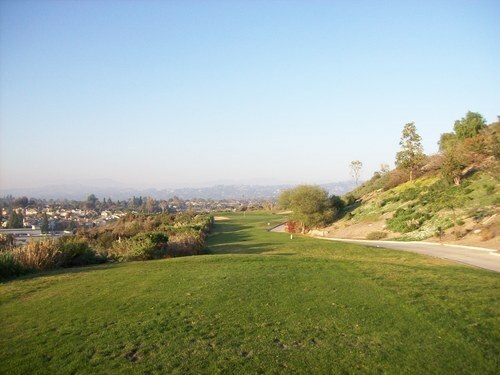 In the past, the course was never as lush as it was Sunday, so you could get away with shots up in the hillside rough that would often trundle back down into the fairway. Sunday, however, that was not the case because the rough would eat up the ball and you’d be left with an awkward stance with the ball above/below your feet and the ball sitting down in the grass. The course runs along a small canyon ridge, so there are a lot of rugged Environmentally Sensitive Area (ESA) hazards to worry about. This is one case where the rough helped some. 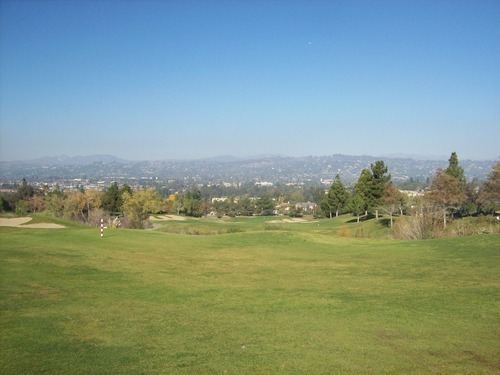 If you missed on the low side of the fairway in the past, you had to hope and pray your ball wouldn’t roll out of play. Sunday, the rough would at least stop your ball, though you’d still be left with an awkward recovery shot. There is a good diversity of holes and designs at Westridge. 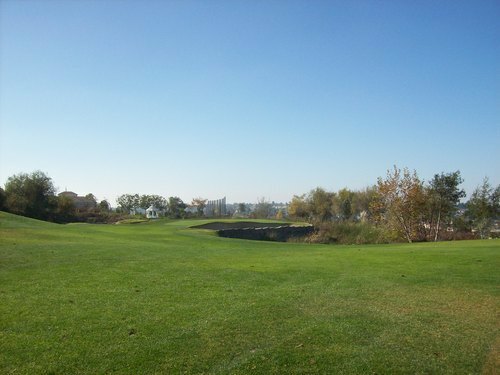 I’m not sure any one hole stands out drastically above the rest, but the 7th is kind of the signature hole with a cool rock wall wrapping all the way around the green for an intimidating approach shot to an almost-island green. 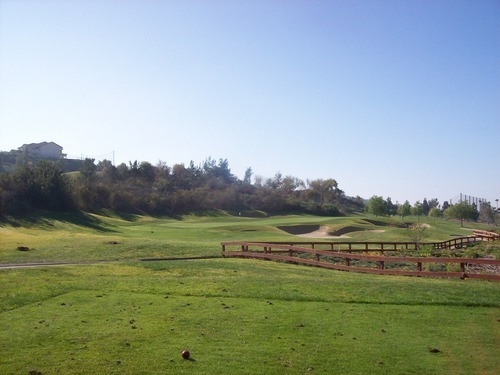 Overall, it’s a nice mix of holes and a very fun overall layout that will keep you entertained and challenged. 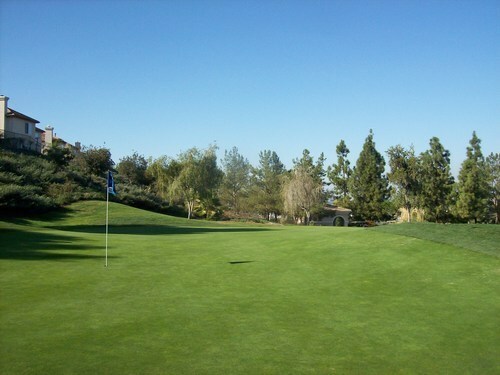 Hit it straight here and you will be left with many good birdie opportunities. 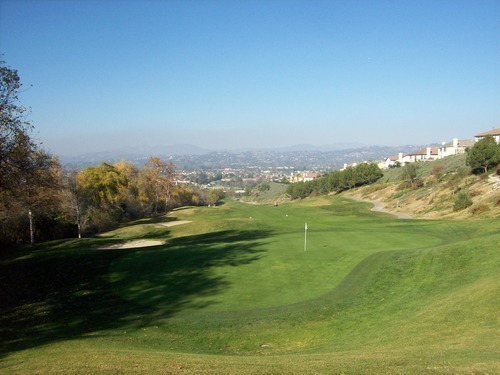 If you are stray off the tee or poor on your approaches, however, the course will show its teeth. 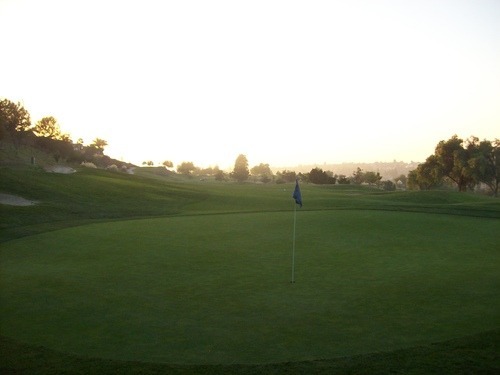 And once you are on the greens, a two-putt is never a guarantee with some tricky undulation. They had some diabolical Sunday pin placements for us, so it was extra challenging on putts. The marshal even remarked that the greenskeeper must have been in a really bad mood that morning, as if they were even more difficult placements than normal. Speaking of the marshal and the overall staff, everyone at Westridge was very pleasant and the service experience was a huge step up from what I’ve encountered in the past here. One last thing to note is the routing. Since I last played here, they have switched the nines. The marshal told me they did that about a year ago. I’m not really sure why. I don’t think it serves much purpose here. In fact, I think the strongest point of the course is the final few holes on what is currently the front nine. I think that makes for a stronger finish than what is now the finishing stretch on the back nine. Oh well. Something about this course (maybe the customers it draws or the routing itself) just seems to inspire slow play. I will say the routing of the back nine is not that conducive to quick, efficient play. 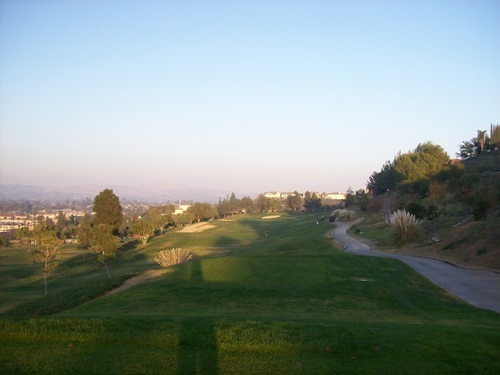 A number of holes are playing as cart path only right now and there are a few parallel holes (with big hills in between) that have people criss-crossing up, down and all over the place in search of their balls. This may be part of the reason they switched the nines, but the pace turned out equally slow for us on both sides, so it doesn’t seem to make a difference. 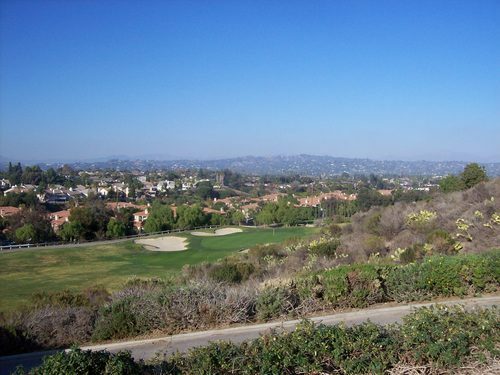 It’s a shame that the course is still struggling so much with pace because otherwise it would be one of the better deals in Orange County at the mid-level price range. 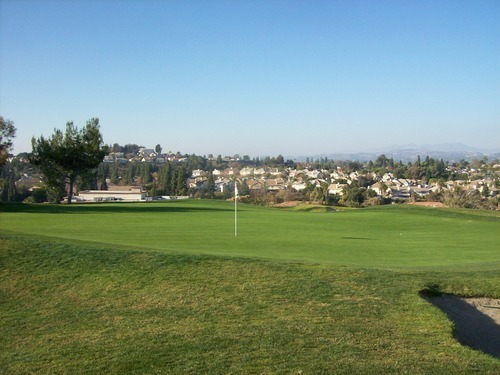 It’s still a tad overpriced for morning rack rates, but good deals can easily be found and the location is pretty good right in the middle of SoCal, though it does take a little driving once you get off the freeways to actually get to the course. 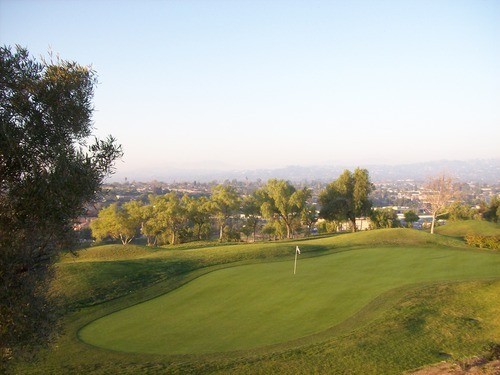 I’m sure this won’t be my last visit to Westridge and it does seem like they’ve made many positive strides since I last played there, so let’s hope it keeps moving in the right direction.